Have you discovered the beautiful Biomes, adventure and scenery of The Eden Project? Not only is The Eden Project within close proximety to the Carlyon Bay Hotel it has a variety of all weather activities all year round whether indoor or outdoor perfect for school holidays or day trips. Whether you would like a guided tour around the largest rainforrest in captivity or dance away with the Eden sessions. Eden has something for everyone. Starting as a China Clay pit in 1995 to opening their doors for the first time in 2001 The Eden Project has grown to be the 8th Wonder of the world! If it was a thrill you were looking for then why not plummet at 50mph from 65ft out over a cliff edge on a giant swing or soar above the Eden Project Biomes on England's longest and fastest zip wire, covering 660 metres and travelling at speeds of up to 60mph. Hangloose at Eden would be perfect for you! For more information please visit the Eden Project website or ask at our Reception desk. The fantastic Hangloose offer a variety of activities for the adventurous! Including the longest and fastest zip wire in the country, a giant 20m cliff top swing, a free fall simulation, jumping off a platform to an airbag of epic proportions, a 16 metre climbing tower and the world’s first commercial freefall onto an airbag! 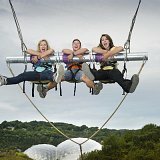 Situated in the spectacular surroundings of the world famous Eden Project, a definite one for all the family especially those adrenaline junkies.